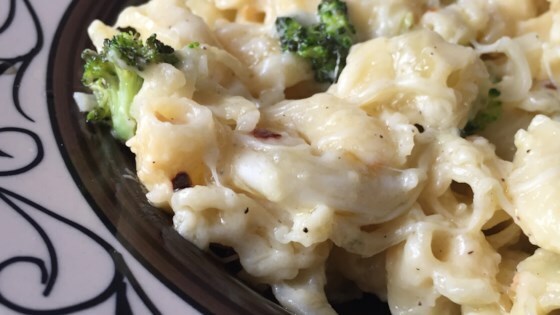 "This is a classic recipe for macaroni and cheese. The kids will love this!" Prepare the elbow macaroni according to package directions. When the macaroni is cooked, spread 1/2 of it into the bottom of a lightly greased 9x13-inch baking dish. Then layer 1/2 of the grated onion, 1/2 of the salt and pepper and 1/2 of each of the cheeses. Repeat this one more time: macaroni, onion, salt and pepper and cheeses, and then pour the reserved white sauce over all. Top off with small pats of butter to taste. Cover and bake at 350 degrees F (175 degrees C) for 45 minutes. This was an excellent dish. I made it exactly as written and we loved it!